In my notes on the process for capturing the text of Cosmos, I described the difficulties in using OCR software to automate the conversion. For reasons unknown, the print quality of the publication varied widely, making the yield from scanned images very low. 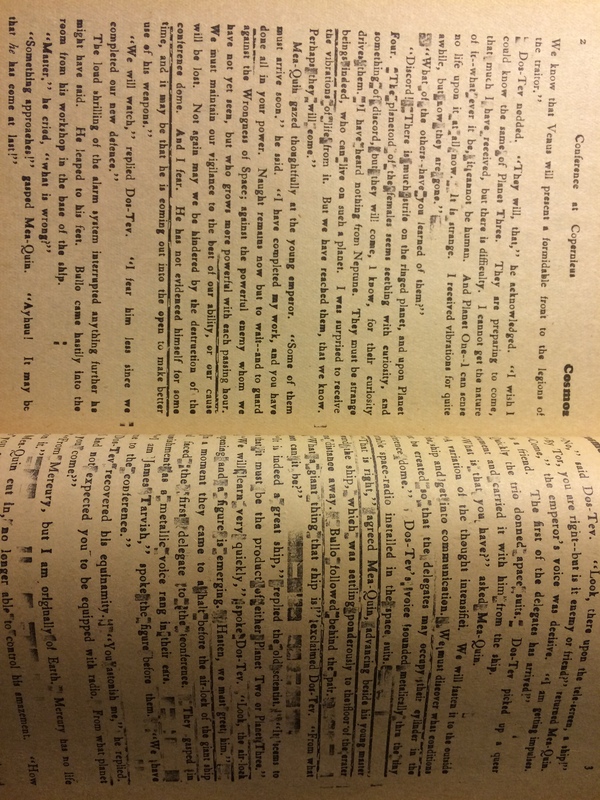 In this issue the problem became so severe that the copy was actually hard to read with human eyes. An example is shown below. (Click on the image to see it in full size.) At this time, Conrad Ruppert was using his printing press to produce both Fantasy Magazine and The Fantasy Fan, so perhaps the wear and tear on the apparatus was taking its toll. COSMOS, with this issue, enters the hardest phase of its evolution. Instead of having ample time to prepare manuscripts, the seven remaining authors will have less than a month each to get their parts in. About half this time may be taken up by the mails, so authors really will be pressed. From now on, it will take real ingenuity to develop. It’s pretty clear that the creation of Cosmos was more than anything an act of will on the part of “Rap.” Coordinating this effort in through “snail mail” must have been a unique challenge. More on how Palmer steered the process with the authors will be described in a forthcoming post. 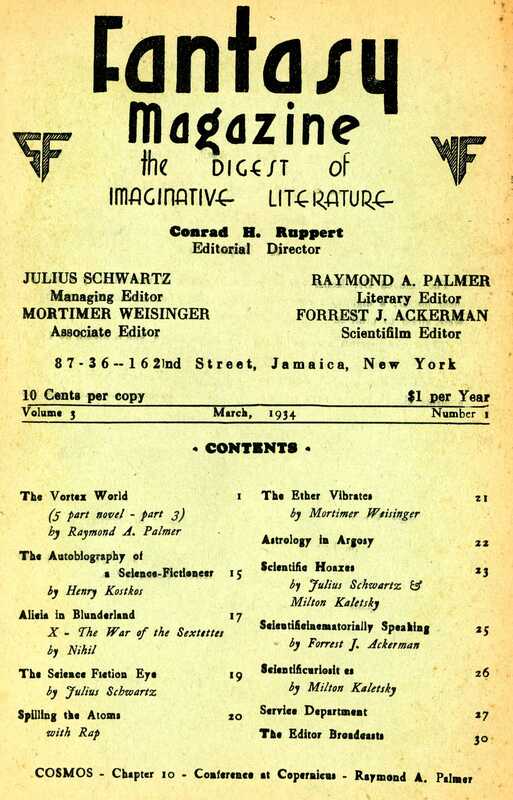 “..However I an very sorry to see you turning the Digest into another fiction magazine… You are stinting space for articles and giving them to fiction. We want a fan magazine – not just another fiction magazine. We aren’t trying to turn FANTASY into another fiction magazine. On the average, we run more pages of articles than we do of stories. And interesting articles aren’t easy to find. Much of the material we are forced to reject because it is merely a rehash of what has already appeared, and really original articles are rare. Miss Winters explains that her beings are spheres of material with a gaseous inside, constituting their vital organs. Their method of communication, as portrayed by Miss Winters, was by using color changes. “COSMOS is good, but thus far it cannot even be compared with “The Blind Spot,” “The Ship of Ishtar,” and the other great classics. It offers an interesting illustration of the styles of the various authors, but the chapters are not so much the parts of a novel as the complete short story. However, there’s still half the story to come. “The Ship of Ishtar” by A. Merritt is often cited by FM readers as a benchmark of quality in the genre. It was originally published in six installments in Argosy All-Story in 1924. The novel is now in the public domain and can be found in the online Project Gutenberg library.